TAHOE 19 / Bill Edmundson / Pelham, Alabama / WDEDMUND@southernco.com / 3-20-07: Hull is complete, righted and working on deck. 6-25-08: I’m coming down to the wire. Hull number and first fire on the engine this weekend. I hope my seats will be ready soon. TAHOE 23 / Bob Monk / North Reading, MA / robert_monk@pem.org / 2-5-08: I started construction in April of 2005. Have been at it since at a fairly slow pace, working around house projects, etc., but now have the frame complete and faired and have started the cold molding process. I have used white oak for the frames, sheers and chines and vertical-grain Douglas-fir for battens and motor stringers. The generous sharing of experience and knowledge through the forum has been very beneficial to me and is greatly appreciated. TAHOE 24 / Jim Kirk / Lake Arrowhead, California / KIRKDDS@aol.com / 6-29-10: I completed this project in 2003. The boat (NautiAnne) is in regular summer use and is currently on Lake Arrowhead, California. TANGO / Charles Austin / c.austin@mskittys.com / 10-4-99: I have started building form. Frames cut and am setting up transom and centerboard trunk. TANGO / Ted Coleman / WA / daddiboy1@msn.com / 9-8-2000, Got the plans today, oh boy! 9-9-2000, Picked up the lumber for the form and frames this morning. Spent the day building the form and rough cutting the frame members to rough lengths, studying the plans. 9-10-2000, Cut out frames and sanded edges smooth to the lines. 9-11-2000, Picked up some plywood. Started transferring the pattern lines on to a piece of plywood for frame assembly. Ordered epoxy, fasteners and gloves. 9-22-00: The frames are complete and I cut out the stem last night. I’m going to build the transom this weekend and glue up some stock for the rudder and get that out of the way. I’ll probably make a spare rudder while I’m at it. I found it very helpful to use a plate joiner for the frames; kept things aligned well, and by the time I glued up the second one got the hang of how to glue “neatly”; Allyn would be impressed! 2-18-2001: Bottom battons installed, scarf cut and glued up chines and shear caps. Built two handy jigs; one for the router to accuratly cut notches in the frames for the battons, and another to route scarf joints in 3/4″ material. 3-18-01/ Shear and chine installed, fairing members and getting ready for planking. TANGO / Ray Walker / Cincinnati, OH / rwalker@hitekmfg.com / 11-3-01: received plans patterns and Boatbuilding With Plywood book. 11-12-01: Started layout of gusset members on 1/2″ INTERIOR cabinet plywood for use as patterns only. My intention is to duplicate Glen-L’s method of frame manufacture by creating “master” templates of each member to use as router guides with a flush trim bit after sawing close. Accuracy and smooth edges from part to part are my goal. 4-17-03: Had to stop on my Tango temporarily due to illness and getting ready to sell my house. Should be starting up again sometime this summer. TANGO / Bob Whitehead / fount306@aol.com / 3-8-02: Finished and sailing: pictures of parts of the construction process are at http://home.bellsouth.net/p/PWP-BestofBobsWorld I have received emails from all corners of the world–people building this beautiful design. Not one person has believed me when I told them I built the boat–they unanimously look at me like I’m trying to pull their leg. Wish I had more time to sail her! 5-2-03: My project was finished in 1998 and I’ve been sailing Into the Mystic ever since. Great boat, nice design. TANGO / Richard Follette / Watkins Glen, NY / rlf46@aol.com / 9-19-06: I have completed construction of the Tango and launched on April 26, 2006. Construction took 400 hours that I did over 2 ½ years. I had originally planned to have it completed a year earlier but I wanted to pay for it as I went and a couple of weddings for my kids slowed me down. Total cost of construction was about $ 6,000 not including a motor, which I already had, and trailer which I also built. TEMPEST / J. Leconte & John E. Talley/ jtalley@driggersandassociates.com / 7-13-98: Boat completed 4-10-96. Resides at Bluewater Bay, Destin Fla. Currently 362 Hrs. on Mercruiser 7.4L with no problems with systems or hull. TEMPEST / Phil Harrison / harrisonpc@aol.com / Benicia, CA / 9-14-02: I started the Tempest project in April and have been taking my time working on weekends and any spare time that I can get. I have finished the Stem, Transom and Frames 1,2 & 3. I plan to finish the frames by the end of October and begin the hull assembly around the first week in November. I plan on building the boat in my driveway that is approximately 45′ long and 27′ wide. The driveway is on a 2% upgrade so the stem/bow will be elevated quite a bit. I will probably reajust the setup locations on the Frames and transom to attempt to lower it a much as possible. I did’t realize how big the boat would be until I had completed the Transom and it stands about 5″ above my head, I’m 6′ tall. So I can imagine trying to fiberglass the sides an bottom, I’ll have to build scaffaling. My son and I are also working on finishing the Wild Thing project that we began last summer (2001). We have just finished fiberglassing the bottom and will put the first coat of Easypoxy paint on this weekend. We plan on turning it over next weekend to begin installing the frames and cowling. We’ll send pictures shortly. We are enjoying our Glen L projects. 5-10-03: Getting Wild Thing done first. 6-16-08: It’s been a few years since I last sent in an update on my Tempest project. We have since moved back into the Bay area and it was just before I was going to start putting the skins on the frames. So, it was still a chore to dismantle the hull and move it to the new house. I’ve since put everything back together and have put both levels of skins on the starboard side and have started the second layer on the port side. My goal is to begin putting the first layer on the bottom in July after I return from a business trip to Paris. I’ve attached pictures of the boat to add to the last set I sent. I Will send another update in July 2008. TEMPEST / Leon Dy / Australia / jemariejoy@yahoo.com.au / 5-13-07: Almost complete except for gear drive and its a v-drive set up with 1″ stainless shaft. Engine power: diesel 6-cylinder 185hp turbo @2800 rpm marinized mitsubishi engine. THUNDERBOLT / Andrew S. Jackson / ajax1@epix.net / 9-23-99: Hull is righted, on trailer, completed aft decking, installed one layer of 1/4″ for rear coaming, broke the piece for the 2nd layer. Bought ribbon strip sapele plywood for fore decking at Harbor Sales in Sudlersville, MD… real pretty stuff. My dad built the Rebel in 1967, still a showpiece and draws a crowd. Live in southwestern PA, not far from Susquehanna river. 1-10-00: I have added pictures of my project to my website:www.expage.com/page/andyontheweb, also includes pictures of my dad’s Rebel. THUNDERBOLT / John Hume / Lexington, KY / JHSTANG51@aol.com / 12-28-02: I have built my building form and am working on laminating the motor stringers. I am awaiting my frame kit from Glen-L. I have purchased a quantity of Honduran Mahogany and am ripping and planing it down to size for longitudinals. I already have some of my V-drive components and hardware. I have built a couple of wooden boats previously (3-point hydros) but this is my first inboard and larger boat project. I hope to be finished for the spring of 2004 (very do-able). I am interested in talking to other builders of this design. My next project is going to be a Crackerbox just because I can, and they have a yearly race where that boat would be kept. I am currently building in Lexington, KY and the boat will be finished in NH to run on Lake Winnipesaukee. 4-23-03: The frames are attached and ready for chines and sheers. I will update as progress continues. THUNDERBOLT / James Fisher / Tumbarumba, NSW AUSTRALIA /jandjfisher@bigpond.com / 10-24-07: Boat is beautiful started out old looking started from scratch. send some pics soon. TINY MIGHT / Jerry Smith / jandpsmith@redshift.com / 6-17-99: Motor stringers, stem and breasthook, frames and transom machined. Prepping for sub-assembly. 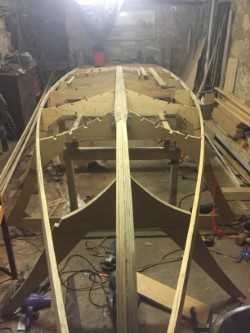 12-19-99: Currently assembling the transom and frames; Stem, breathook, and motor stringers laminated, ready for trimming. TINY MIGHT / Tim Domes / Ft Lauderdale, FL / sspeed@optonline.net / 5-24-02: So far located and purchased an engine, Phantom 4-75, so I guess I have officially started the project. Hopefully it will work without having to modify the plans. Will be taking lots of pictures and hopefully setting up a web page. I made the trip, 2800 miles total… I picked up two engines the Phantom 4-75 which I mentioned, it is in great shape. I also picked another engine 50 miles away, though it is in bad shape, I got a bucket full of parts also. I am very happy with this find it just happens to be the Phantom 4-45. I will start to disassemble it this week, if it is salvageable I will get this one running and save the 75 for a larger boat. I think I did very well, both engines cost $350.00 for the 75,and $50.00 for the 45. I also got the factory instruments for the 75, with only 450 hours on the meter. The trip actually cost more than buying the engines. 4-17-03: I have found everything I needed to restore the Graymarine Phantom 4-45 and I have some of the wood for the hull. As soon as I move some stuff around and make room in my garage I am going to start building the hull. TINY MIGHT / Larry Hinton / larry.hinton@cox.net / 6-25-06: I have always been a fan of the Crackerbox. I recently went to check out a reported Crackerbox and found it to actually be a 12′ Tiny Might with the Ford V8-60 engine installed. She’s now sitting in my garage. I would like to hear from any other Tiny Might owners. Any help would be appreciated. TINY TITAN / Andy and Gary Shaffer / Pennsylvania / apshaffer@csonline.net / 1-15-02: Construction almost completed. All steering and throttle/shifting installed. Emergency stop switch installed. All that’s left to be done is painting. We chose epoxy encapsulation. An extremely fun boat to build, we will send construction photos soon. TINY TITAN / Ron Williamson and Brad / Calgary, Canada/ gshall@shaw.ca / 8-9-02: On March 23, 2002: we pulled the kit out of the Storage room. The plans were looked over and read through. On the 29th, we were half way done. We had the 2 frames on and were just putting on the transom. To get the angles of the wood flush on any piece we used a power plane. April 7, 2002: The boat was ready for paint. We painted it a brilliant red and white. For the Decal I made a Giant Devil’s head and named it Little Devil. August 5th. Little devil was put into the water for the second time. The first time we tried a 5.5 engine and now we are trying a 9.9. The boat was a rush. Brad almost dumped it and his cousin Todd almost dumped. 4-20-03: My email is still good. I have tried out the boat and it is a rocket. By putting one fin on the inside of each runner the boat is more maneuverable and will have more grip in large waves. (large waves= 5 inches high). TINY TITAN / Stefan Sandberg / Stockholm, Sweden /stefan.sandberg@scania.com / 1-14-03: I started building a Tiny Titan 2002-11-01 for me an my son. I’ve got limited time but so far I’ve managed to cut out the bottom planking and fit the runners. I’ve finished frame no 1 and now I’m finishing off frame nr 2. After that I’ll start on the engine transom. I’ve mounted the boat at a suitable height on two wooden beams which are inclined at 45 degrees to the floor. In this way I get an adequate working position and I save valuable workshop space too. I intend to run the Titan with a 9 hp Suzuki engine. Won’t have it finished this summer – summer of 2004 more realistic. 4-21-03: We’ve got summer here in Sweden right now and therefore thousands of things to do. The project is on hold for the time being but I’ll pick it up during our autumn. TINY TITAN / Steve & Andrew Allen / Sault Ste. Marie, Ontario /sallen_pts@hotmail.com / 7-17-03: Ordered plans for a Tiny Titan from Glen-L in May and actually began construction the weekend of July 12th, 2003. This my first experience in building a boat, and learning the parts names and boat lingo is an education in itself. We are at stage #2 gluing up the frames and attaching the bottom battens to the bottom planking. Since we bought only the plans and not the kit, I am amazed at how much cutting and ripping of lumber there to this project. It’s not a problem though since my Son can cut out the pieces during the day and I can assemble them during the evenings after work. We have a 1962/ 16 hpr Johnson we are going to strap to the transom. Should be a lot of fun once we hit the water. TINY TITAN / Glen Wilcox / Oak Park, CA / glen-wilcox@peoplepc.com / 8-11-03: Completed. I began building last fall and launched in January. The second outing was this month, August, ’03. Both outings have seen water too rough for good planing. I’m disappointed that so many lakes near LA don’t allow boats this small, presumably to avoid personal water craft. I deviated from the plans in only one area. 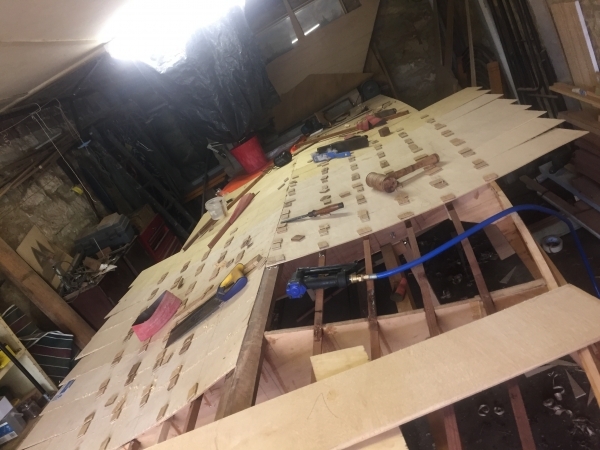 I used a longitudinal batten (or carling) on the inboard side of the coaming from the dash beam forward, so that the forward decking could be mounted between the coaming instead of on top of it. This gives the coaming a nice clean line from stem to stern. Photos and performance info when available. TINY TITAN / Pat Larkin / Springfield, Pa. / hocars@patsslotrods.com / 11-16-03: Started project: 8/03, hull completed 11/03. Lots of sanding now. I will submit a couple of shots when it’s finished. For the record, this has been a very fun project. I was lucky to find a 1987 Johnson 25hp. To be safe, I added some extra transon support and 7 yards of fiberglass tape to all the stress points. This is in addition to the full fiberglass covering kit, and 3 gallons of epoxy. This will be one tuff boat. I went with a tele-flex steering systen and the stock OMC controls. I will need to add a lanyard kill switch, and get a fin. TINY TITAN / Alfred Marshall / motorboat@carolina.rr.com / 2-2-04: My son and I put together a Tiny Titan when he was 12 as I wished my Dad had done with me. My daughter; however, has enjoyed our Tiny Titan the most these last 7 years. The stock Evinrude 15HP pushes her along at 32mph. My son made the whale’s tail (hydrofoil) out of 1/8 inch scrap aluminum. I highly recommend the tail as it helps the Tiny Titan to plane off flat AND settle off a plane flat. When running, the tail flies 3/4 inches above the surface. I also recommend using a control box and Glen-l’s steering kit to control the boat running a 15HP motor. The adjustable seat not only contributes to control, it adds considerably to comfort. Great design and little boat! TINY TITAN / Bill Wright / Osterville, MA / bwright18@comcast.net / 6 Jun 2004: I completed the Tiny Titan last fall. I started my 13 year-old son out with a ’50s classic Mercury Mark 5 outboard, set up with a dead man throttle and stock prop. He drives it easily, and has topped out at 23 mph. Not bad for 5 horsepower!! This was just to get him accustomed to the feel of the boat. We are now working on a classic Mercury 10 Lightening. TITAN / Doug Harrison / Cobourg, Ontario, Canada / offshore@bell.net / 5-19-2010: I am building the stretched version of the Titan in plywood. I started in the basement Jan 09 and got the frames mounted last summer (after completing a building to work in) and had to shut down for a while due to work commitments. Back at it again and just finishing the second layer of ply on the hull. Have the motor and trans. (a Kubota 29HP) I intend to run dry stack and keel cooling. Getting slowed down again as I’m building another house for move in this Sept. Really hoping to launch next summer and head up the Trent system to Georgian Bay for a month or two. Would be glad to answer any questions regarding the build so far. 11-12-11: Well, back at it again after building another house ( and a boat “garage”) Will be on it full time now till completion. Have the hull done and almost ready for paint. The waste and fuel tanks are complete as is the rudder ( a Schilling style I wanted to try ). Have done a mock-up of the interior, and established where everything will fit, and am now completing the v-berth and forecabin. There is room for a regular head as well as a small hanging locker in the fore cabin. Have also gained 8″ in the main cabin. Decks will be next. TNT / Terry Mortimore / Canada / terry.mortimore@sympatico.ca / 7-10-97: Complete. TNT / Sean Wadsworth / Mississauga, ON, Canada / seanwadsworth@eamil.com / 1-4-99: Frames on form, longitudinals installed, fairing. 5-30-99: Now installing bottom planking, almost ready to flip the boat over. 10-29-99: Completed the boat middle of August and had it painted. Launched it the last weekend of the summer. Handles great and is definitly an eye-catcher! Pics coming. Thanks for giving me a memory that will last a lifetime. Sean Wadsworth, age 18. TNT / Jeff Wilbanks / Drumsome68@aol.com / 4-20-99: I received my plans and within three days I have already finished the frame work and chines. I am now trying to locate the plywood to begin planking & decking. Thanks Glen-L , for giving me something fun to build ! TNT / Cam Hansuld / Mississauga, Ontario, Canada / cam.hansuld@sympatico.ca / 5-8-01: I built it in 1970 from a fame kit purchased locally ( I was 13 years old at the time and paid for the materials from my paper route), currently in storage with corner ply of middle frame in need of repair. 5-7-03: My son is getting close to cutting plywood for his TNT. Mine built circa 1970 will have to come out of storage soon. TNT / Chris Power / Email address not valid 5-6-03 / 6-20-01: I am constructing your T-N-T, The plan’s are clear and easy to read. Currently we are completing the interior of the boat and I am realy looking to the day we will launch the boat! Thanks for designing such a beautiful boat. 9-5-01: I am now painting and finalizing the hull design now, my T-N-T looks great. I am planning on doing the interior French Blue and the exterior metallic black with some blue decal designs. The rear end of my boat has me slightly modified with a step up behind frame 3 and the transom, this should outline a more vivid “cockpit”. I am also planning on adding a windshield and have a built-in gastank in the bow to stop porpoising. A subfloor with foam under it for flotation, and the bow has been filled with flotation, this will greatly improve the safety in case it capsizes. 10-10-01: All the woodworking is done, we are currently getting ready to fiberglass the hull. I picked up a 1975 40 H.P Mercury motor in Vancouver for about 800$. I am planning to get a C.D stereo for the boat… will see 5-22-02: Work on my TNT is almost complete, all woodworking is done, and I have started the Epoxy Fiberglass. The outside of the boat will be painted a hot racing yellow! To make the boat more fun, we installed a Clarion CD player, 2 speakers, a Sub-Woofer to give it a little kick, a tachometer, a speedometer, and a Depth-sounder since it will be used in a lake with vastly varying depths. All and all, it will be a great boat when its finished! TNT / Mike Blanchfield / mike-bethblanchfield@email.msn.com / 7-29-01: I started buyilding the TNT (modified to 12 ft. long) in June of 1977 when I was 15 years old. It was launched that August and powered by an old (1958) 35Hp Johnson Sea Horse. I used the Glen-L galvanized fastenting kit and the fiberglass deck cloth covering kit. I used the boat for four summers with various improvements in each summer. It would run approx.30 mph and was a great experience that brought a lot of great memories. After my sophomore year in college I left for a summer job in Texas and realized that I wouldn’t use the boat again like I had. My parents sold it for me while I was away. Now I have built my second Glen-L boat (Kingpin) which my family has used for the past 10 years. It sure would be nice if we could find the first boat I built. It was painted white on the bottom with a blue top with white stripes. We sold it in the summer of 1981 in Wilmington, DE for I think $300. 5-26-03: Email valid. I have been very pleased with your products. TNT / Matt Redmon / digitlink@juno.com / 7-7-01: Cutting out frame pieces. 5-17-03: Thanks for reminding me about the registry. I have finished my freshman year of college, which has left me with little time to work on my tnt. My boat is near completion. The next step for me is to complete the interior. I expect it to be done by late August of this year and look forward to getting it on the water. TNT / Don Wickett / Oklahoma City, OK / Email address not valid 5-6-03 / 9-30-01: Project complete, titled and ready to go. Bought wood 5/5/01 by 7/03/01 was ready for painting and then adding seats. I installed three seats, opting out the motor well and only brought fore deck back to #3 frame. Might build a removable deck to cover the front seat, so it would resemble the original design. Thanks Glen L Marine. TNT / Don Slomke / dslomke@adelphia.net / 11-2-01 Just received my frame kit. Built form today and will move into basement for assembly. 11-9-01 Keel, battens, and 1st lamination of sheer clamp on. 11-11-01 Sheer clamps and chine logs on, ready to start plywood. (Hint for installing longitudinals with sharp bends: wrap with bath towel and pour boiling water on the towel and let sit over night, works great!) 11-28-01: About 2/3 of hull / side planking complete. ( I took some time off for deer hunting) 12-8-01: Began fitting final piece of bottom planking today. I should be able to turn over and start topside next week. 12-12-01 Turned hull over and began topside construction. Only about 40 hrs into it at this point. 12-21-01: Topside planking nearly complete. I plan to varnish hull inside this week and complete planking. I made some changes to the deck, I will E-mail in process photos a.s.a.p. 1-13-02: All woodwork is complete. I will turn hull over and begin fiberglassing 1-14-02. 6-23-02 After a long time off, I finally got back to work on my T-N-T. Today I covered 1/2 the hull with fiberglass cloth. I expect to finish the bottom and be ready for primer by the end of the month. 7-21-02: All the fiberglass work is done. The hull has been painted and lettered and I will turn it over to paint the deck today. I hope to have it in the water by 8-1. I will send photos a.s.a.p. 7-27-02 The hull is completely painted and lettered, the jackplate and motor are installed, I just need to build a seat and finish my steering parts. I’m shooting for a launch by 8-3-02. TNT / Jim Epp / Saskatoon, Canada / jamesepp@sasktel.net / 1-15-03: I began my TNT last spring(2002) but was pulled away to assist a friend with another project (building a log cabin). I’ve completed the framing and was nearly finished attaching the plywood. the project will continue again in Spring (’03). TNT / Keith / Oceanside, NY (Long Island) / Keitho51@aol.com / 3-17-03: After months of staring at the plans and thinking things out, our weather went from dead-of-winter to a balmy 68 degrees. With my wife out of town until Monday the 17th, I cleaned out the garage and started building the mounting frame. Made several errors, including cutting the main 2×4’s too short (Don’t ask me how I did that!). Picked up fresh 2×4’s this morning at Home Depot and had the frame completed by early afternoon. I now have to go to the local specialty lumber yard and start buying some of the materials. I also need to order the fastener kit from Glen-L. I am trying not to think about the big picture and just take this project one step at a time! TNT / Mike Harvey / Tampa, FL / Mharvey@Mharveycpa.com / 9-30-03: My three sons and I are building the TNT. We live on a lake and in addition to our current armada of Malibu ski boat, Maverick flats boat, canoe and jet ski (one can never have enough boats) the kids felt like they needed a small speed boat… We ordered the frame kit, fiberglass kit and fasteners in August 03. As of this date we have built the frame and planked the sides and bottom. We are now filling and sanding many screw holes in preparation for turning over. We are using AB Douglas-fir and plan to paint the hull and use a mahogany veneer on the deck. 11-16-04: After a slight hiatus we are back at it. Painted the bottom and sides with Awlgrip. Turned over and are adding deck beams and planking. Bought a lift plate to provide more set-back and vertical height adjustment for the motor. TNT / Seth Gray / Cranberry Island, Maine / grayseth@hotmail.com / 1-16-04: I am 14 and am building the TNT for summer use. I live on the island all year round and the winters get pretty boring. I built this boat by myself with only a little help from my father who is a professional boat builder. I am almost done and only need to install stearing and the motor. I can’t wait until summer to take it out. TNT / Mark Kimmerly / Queensland Australia / markw49@hotmail.com / 3-18-04: Starting on frames. It looks simple and complicated, but should be a challenge. Any comments or hints from other builders would be most welcome anytime. I plan to put a 30 or 35 HP on it. TNT / Wolfgang Weitzel / Friedberg, Germany / wolfgang@wweitzel.de / 5-10-04: I bought the plans last winter and started building frames and transom. Now the frames and keel are mounted and have I started to bend the chine logs around. Bending is more difficult then I expected. Found a hint to wrap it with towels and put boiling water on it, hope to succeed this way. 7-16-04: Today I glued the bottom battens. All Framing is finished now. Begin with fairing and then planking. No real problems so far. It’s always fun working on the boat. Thought it would go faster. Planned to go to the water this summer, we’ll see. 4-25-05: Hurrah, it’s finished! All woodwork and part of the finish is done, only some painting and minor details, then we go to the water. Have a 25 HP Yamaha outboard, soon I will give you info about performance. I think my TNT is a really nice and good-looking boat. 9-8-05: Well, not very soon, but here are the results from our first summer with our new TNT. With two adults the boat is going about 50 km/h, when I’m alone may be about 55 km/h. It’s up on a plane in 3 seconds. Cornering at high speed is difficult. A keel-fin as specified on the plan is a must. I will put it on in wintertime. Our TNT is always an eyecatcher and we had many friendly discussions with other boating people. TNT / Ken Young / youngshd@comcast.net / 8-13-04: I have just started construction on my T-N-T. I have ordered stock, and built my form. Hopefully it will start taking shape very soon. TNT / Michael and Michael Valparaiso / Indiana / Viper911611@verizon.net / 3-1-05: We are still cutting out the pieces. We have cut out all 3 frames and are now on the motor board, transom, stem, breasthook, etc. As soon as we start building I will send some pics. 3-5-05: Today we cut out the stem, breast hook, motor board, and transom. Next step is to put together all the pieces and then we are on our way. 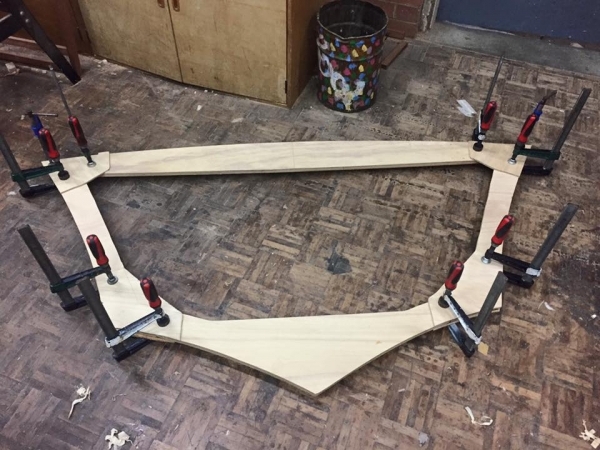 TNT / Robert and Andrew Malec / Sydney, Australia / malecs@bigpond.com / 8-30-05: So far we have put the whole skeleton together, and are half way through the beveling stage… and yea, so far really fun to build. Cheers. TNT / Nigel and Kenwrick Mayo / Brampton, Ontario, Canada / nigel@nuraseal.com/ 9-4-05: My son and I started construction of the TNT in October 2005, and launched at the end of June. We have a 35hp Johnson and we get about 35mph tops. We had many challenges along the way, though finished with a beautiful, exciting boat. I would highly recommend bolting on the motor (not just relying on the clamps) as we almost lost the motor when the whole boat came out of the water at 32mph and the prop hit the water again at 5500rpm. The motor rotated sideways about 20 degrees, leaving only one clamp on the transom. Our finished project weighs 282 lbs! This includes fiberglass bottom, seats, floor boards, teleflex steering, gas tank and full size marine battery. The motor adds another 131 lbs (1977 35hp electric start johnson). TNT / David Ruff / Denton TX / davidsbox01@yahoo.com / 10-17-05: Here is my TNT, I started it in Feb of last year and took a 9 month break. It is getting glassed over now. From there I will float test it, then build the cockpit. It has an 18hp on it now but I will move to a 35 as I get the boat’s hull number and inspection done. Am loving this build. 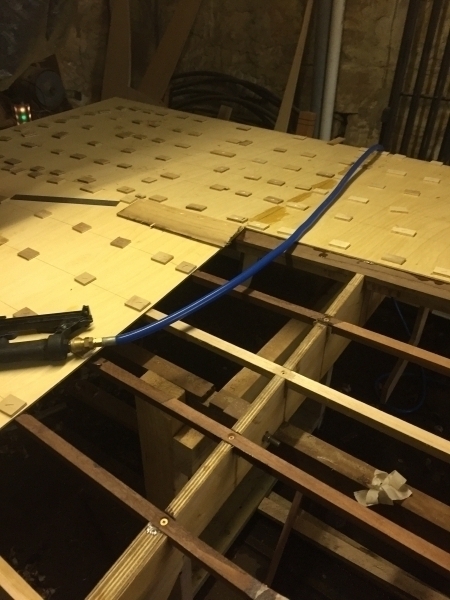 Will be float testing the boat next week – just need to glass the sides. Will update my site as those and other pictures come in. I HIGHLY recommend this design to the first timer. TNT / Kevin and MacKenzie Reid / Mattawa, ON, Canada /kevin.j.reid@sympatico.ca / 4-5-06: Just completed cutting out the frame pieces. TNT / Chuck Stevens / Royal Oak, Michigan / cvs_54238@yahoo.com / 9-10-06: I purchased the plans for the TNT about a month ago. I have accumulated all the necessary lumber to make the building jig. I have studied the plans. I am going to increase the of the building form height 1.5 inches and mill slots for the frames and add a 12 degree bracket on the rear for the transom. Most of the parts for the frames, are already cut out and only have to assemble them. I am going to adjust the hull lenght to twelve feet so that I can move the seat a bit forward. I plan on powering the craft with an Evinrude 15 HP engine that is like new. TNT / Tom Lundquist / Portage, Michigan / lundtdl@charter.net / 8-1-07: The TNT was a really fun and rewarding project. I’ve done many construction projects around the house, but this was our first attempt at building a boat. We started in the fall of 2005 and worked through two cold Michigan winters in the garage. We launched it in June 2007, so it was a little less than a two year project, only being able to work on it some evenings and weekends. My son is now 13 and having a blast! Thanks for everything through the process. Your plans and products are great and the customer service and helpful hints along the way were awesome! I’d be happy to share our experiences with anyone who may be interested. TNT / Gary Dowsey / Perth, Australia / Gary.Dowsey@swantafe.wa.edu.au / 6-11-08: What a great design to build, very quick and straight-forward for a cabinet-making lecturer. l received my plans on May 22 and I have the hull built now and preparing it to take the epoxy and cloth, but our weather is in Winter mode here so I’m getting mad coz lm just idle for the time being. TNT / Andrew Bangsberg / Cumberland, Wisconsin / tnt@bangsberg.com / 7-22-08: Started in Jan 2006, completed in July 2008. I slightly modified the TNT design by curving the top of the bow and adding a hatch cover behind the seats. She is painted with Interlux Perfection. I used a Taco Marine rub rail (I highly recommend you protect your boat with a rub rail). The engine is a 73 Merc 20 hp, with electric start. After 2 1/2 years she is finally in the water and a blast to drive. More pictures and details are available on http://www.bsehosting.com/get/tnt/bizweb.asp. TNT / Dan Brennan / Vancouver, Canada / dbrennan@hemlock.com / 10-10-08: Building the TNT – first project (total newbie) – just set up the garage and bought materials for the building form – going to get it done tonight and then out on the weekend to get the mohogany for the frames. Been reading tons of info on the forum, great tool! 1-16-09: Frames and transom are finally completed. Stem laminating and breasthook ready to go, just waiting for a warm enough stretch to be able to glue it all together. Looking forward to finally getting the building form up and frames attached so it starts looking like a boat! 3-10-09: Finally looking like a boat! All frames, transom, stem, etc. all up on the form, both chine logs installed and actually very pleased with how it all turned out. All level and true. Sheer clamps are next and then battens. Should have those installed by the weekend and then begins the fairing process… Tons of fun, it’s on my mind all the time and I love it. Thanks for all the online support you provide through your site (info, forum etc.) Also the phone interview was great, looking forward to the next one. TNT / Kevin Korell & Son / Lincoln, Nebraska / kbkorell@windstream.net / 6-20-09: Hi, I am Kevin Korell, my son and I are building the TNT. We are born and raised in Nebraska, and not a lot of folks around here are familiar with boat building. TNT / Stephen Hayward & Son Thomas / Markham, ON Canada / shayward@pxltd.ca and thayward@bell.net / 4-16-2015; We have cut all the pieces for the frames and are starting the gluing and assembly process. TOPPER / Michael James / Wellington, New Zealand / mjames@ihug.co.nz / 11-18-07: Just started and loving it. I brought the plans for the Topper and Glen-L 25 in the early nineties when my family and I were living in England. Our circumstances changed and we moved home to New Zealand. This unfortunately meant that my plans for building a boat went on the back burner for more years than I wanted. 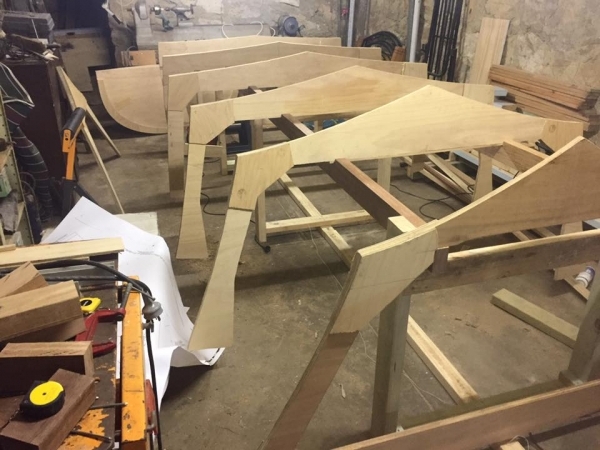 However all is under way now, forms all marked out and ready to cut, building space all sorted, local suppliers of plywood and bronze ware found, and a method of providing cover during the build sorted. I’m building the Topper first before the Glen-L 25. 4-12-08: After a slow start, two month delay due to the timber supplier ordering the wrong amount of mahogany, the build is progressing well. 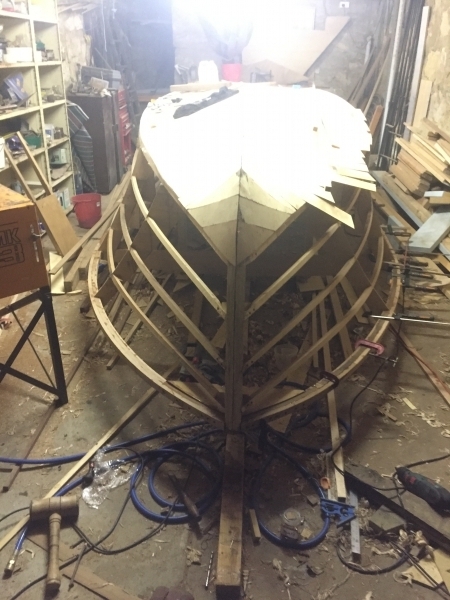 Transom and stem mounted on building form, shears, knuckles and keel dry fitted to transom and keel, dagger board and dagger board trunk made. Next step, glue it all together. TOPPER / Mike Basham / Oxford (Atlanta), Georgia / basham944@hotmail.com / 5-27-09: Hull complete, now finishing mast, dagger board, rudder, etc. TOPPER / Gary Adams / Salt Lake City, Utah / gary27403@comcast.net / 11-12-09: I have finished the hull. I am now working on the mast, boom, etc. TORNADO / Mike Babin / shredder@ev1.net / 9-6-99: Started project 6-12-99 from plans & patterns. Set up, framed, keel, chine, sheer installed. Most fairing complete. Will start side planking 9-11-99. This is for the most part a weekend project. My job gets in the way… go figure. This is a great stress reliever. 5-10-03: The project has come along very well, actually. It has taken me a long time, but that has much to do with my job and other priorities. I got into the project fully aware that it was going to be drawn out over a couple of years, so I’m happy with the progress. The boat building portion is complete. It was very straight forward. I’ve just completed the painting and graphics with House of Kolor Kandy Kolors and am rigging now. I hope I can stay in town long enough this summer to complete it all. TORNADO / Paul G. Miller / Memphis, TN / pmiller1@midsouth.rr.com / 7-16-01: Began construction with plans-only purchase in September 1989. I’ve been rather slow in building, but I like to say that the “getting there” is as much fun as “arriving”.As of July 2001: I have finished the bottom, complete with blood-red IMRON paint, and have just rolled it. Topsides and interior/rigging is beginning. I have purchased much of the hardware as I go and am planning on a 383 CID small block Chevy (stroked 350) in this boat. I have a Casale 12% overdrive v-drive or, alternately, will go “retro” with a Halibrand 15% v-drive that I’ve rebuilt to new condition. A Borg-Warner 72C will provide forward-neutral-reverse. As of April 2002: All wood and epoxy-glass has been completed. The final sanding of the deck and cockpit area is being done in preparation for painting. Blood-red Imron will be used to complete the topsides; light gray in the cockpit. Seats are bought and test fitted on custom-made stainless seat supports. Steering is in. An Ultraflex (U-Flex) rotary helm was selected over other rotary types for two reasons: 1) the U-Flex uses a three-gear planetary gear system that offers greater contact with the push-pull cable than other helms; 2) the U-Flex is only a little more than 3 turns, lock-to-lock. Teleflex items were used for all cable mounts and connections in the steering. The motor finally selected is a little larger in HP and Torque than originally mentioned – a 406 cu. in SBC. This is mated to a bracket-race Powerglide “shorty” transmission which will be operated without a torque converter, driving the pump directly from the crankshaft. The driveline is presently being fabricated, using 1350 Spicer components. The cavitation plate and adjustable controls are all in place. Finally, the prop selected is a steel 2-blade item from Menkens. As of July, 2002: The boat is fully painted in three coats of deep red Imron; the cavitation plate assembly is installed; the underwater gear is installed; instruments and switches are installed and wired; waiting for the rebuild of the Casale v-drive to complete installation of the driveline. Project pictures can be seen at http://groups.yahoo.com/group/Glen-L-Builders (not affiliated with Glen-L other than we all build the boats). 5-8-03: I have completed my project and am waiting to get time to take off from work for a week to get it into the water. I anticipate some minor “adjustments” to the drive systems that I will have to attend to. TUBBY TUG / Murphy Lege / mlege@leo.infi.net / 7-9-01: Have all parts cut out and in the final stages of encapsulating. Hope to begin assembly tomorrow. 8-12-01: Hull stitched together, Hull fillets almost complete, really starting to take shape. TUBBY TUG / Pat Morrisey / Foster City, CA / patfly@comcast.net / 1-3-05: I have just begun. I have purchased materials – Frame, plans, fasteners and fiberglass kit from Glen-L. “Found wood” from my shop. I have the bottom laid out on sawhorses and have constructed a 4′ x 8′ sheet of carbon paper for tracing. It is humble, but a beginning. I have been successful in winning bids for a 7″ Brass Ships Bell and a 18″ Ships Wheel on EBay. There is no turning back now. TUBBY TUG / Paul Koons / East Lansing, Michigan / pkoons2562@sbcglobal.net / 1-15-06: Started yesterday with the purchase of Okoume plywood and have since traced and cut out bottom. Today we traced the rest of the patterns and while we take time out to go to grandma’s for dinner, we will try to cut out the rest of the patterns. Still need to order Epoxy kit and plans for the ETM. 1-16-06: Finished cutting out the rest of the patterns today. I also constructed a dolly out of 2 X 6’s with casters so I could move the project around in my garage. Also ordered plans for the ETM mount so I won’t have the same lines across the transom as the plans call for. I will have to try and construct a pattern for the transom bulwark. Even though I’m the captain of this vessel, I still have to answer to the Admiral. She says to slow down a bit on the purchases for a cycle or two. I haven’t told her yet that I’m planning on buying a new 50 lb thrust electric trolling motor only to cut it in half. 1-23-06: received the ETM plans and stitching wire. Will need to modify the plans some but should be able to fit it in. Plan on ordering the epoxy kit tomorrow and will pickup the hardwood for the cabin on friday. Still haven’t figured out how I will apply the epoxy in my garage with temperatures in the 20’s to 30’s. I’ll cross that bridge when I come to it… 3-5-06: I received my Epoxy Kit in early February, and decided to wait until warmer weather to start this task. Well, I couldn’t wait. I’ve encapsulated the bottom, glued the cleats to the bulkheads and today, encapsulated the bulkheads. I’ve been bringing the pieces into my basement workshop where the temps are around 65 degrees. Once the bulkheads cure, I’ll start stitching the sides and transom out in the gargage but after that, I’ll have to wait for warmer weather to do the fillets. 7-18-07: Well it’s been awhile since I’ve updated my project. It seems like I’m always hung up on cold weather. My prime building hours in the summer months are spent on my other boat, a 42’ Chris Craft in Grand Haven on Lake Michigan. The Tubby Tug hull is complete, and the cabin is complete as far as the structure goes. I still have to insert the front windows and fasten them down. The water cannon pump is mounted on the inside of the front bulkhead and plumbed to a thru-hull for water pickup. I’m working on the dash-board, mounting the helm, buttons and switches for running lights, interior lights, buttons for the horn and water cannon, gages, Ammeter and Battery Condition. Still have to add trim and bumper to hull, finish top side of water cannon, run steering cable and wires for electric motor controls. I’m still waiting on running lights and interior lights to come in. I am using a Safe-T QC steering system with an 8’ cable. I would be interested if others have used this as well. It has a ¾” tapered shaft and my ship’s wheel has a 1” keyed hole. Haven’t figured out what to do yet. All my trim pieces are finished with a dark stain and 4 coats of spar varnish. I will need to add another coat or two once it is installed. If we have an early spring this year, I expect to have her in the water before boating season starts. TUBBY TUG / Eric Staggs / Spokane, WA / eastaggs@gmail.com / 2-9-06: I have just finished the stitching of the chine and sides, will be epoxying today. TUBBY TUG / Kevin, Kathleen and Colleen Murphy / Roswell, GA /kmurphy826@hotmail.com / 7-18-06: We have the plans and the wood. We think that we understand the directions, The screws, nails stitching wire and epoxy are “in-transit”, having been ordered on-line. 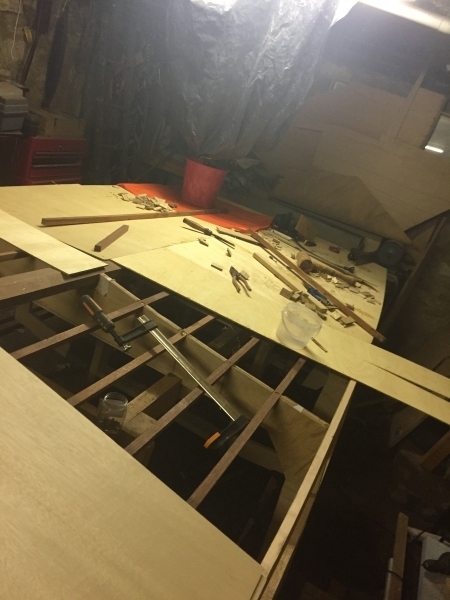 At this point, the bottom and the knees have been cut from the 3/8″ plywood and patterns are being traced to the first 1/4″ plywood to make sure that I can get all of the pieces out of it that I am supposed to. 7-31-06: All of the pieces for the hull have been cut and most have been encapsulated with epoxy. The encapsulation process is very time consuming, especially since my space is limited and I have to do it in stages. I’ve been trying to get the pieces coated in the order that they will be assembled, and have been fairly successful. I’m a little behind on the transom. This past weekend, Kathleen, Colleen and I attached the bulkheads to the floor. The shape and size of Tubby Tug is much more apparent. We are all anxious to get to the stitching. TUBBY TUG / Mark Stevenson and grandson Damien Engblom (age 7 1/2) / Sturgeon Bay, WI / m70250@dcwis.com / 12-6-06: We (my grandson and I) have just received the plans for the tubby tug and are now transfering patterns to plywood. The bottom is cut and we cutting other pieces. This is a project for him and he is very excited. Launch time is scheduled for spring. We live in Sturgeon Bay, WI. right on Little Sturgeon Bay so this boat will be used by him a lot. I plan on using electric power at this time. I made copies of the boat profile and Damien is designing color schemes for it now. TUBBY TUG / Kevin Brown / McDonough, GA / kb@lilwoody.com / 10-25-07: As of Oct 2007, I have finished the glue-up of the hull and flipped it to cover in fiberglass. I have begun the cabin. I travel with my job and am only able to work on the boat every other week-end. I have 31 hours build time into the boat and plan on finishing by Jan of 2008 (my daughter’s birthday). I have a website that is documenting the build. TUBBY TUG / Trent Morrison / Damascus, Oregon / trentm@metrocpr.com / 8-9-08: Received plans on 8/7/08. All patterned plans are cut out, looking forward to hull assembly. TUFFY / Anthony Moschella / Email address not valid 5-6-03 / 10-8-01: First time boat builder, with some (limited) carpentry experience. I’m 21 and a full time student at Brown University in Providence, RI and I’ve been dreaming of building my own boat for years. This summer working nights and weekends I finished the Tuffy. The project was built entirely in my garage in Cedar Knolls, NJ. I worked on it most weekends and tried to work a few nights a week. I completed the project in 3 months to the day, beginning on 28 May 2001 and finishing on 28 August 2001, two days before I had to go back to college. So I never got a chance to put her in the water. I can’t wait until spring. I still need to finish the interior, mount the motor, and install seating, but otherwise its complete. It came out amazing, especially for my first try. The hardest parts were bending the chines and curving the foreward portions of hull sheeting. For the chines I had to depart from the plans and use 3 laminations of 1/4″ oak lattice instead of the the 1″ mahagony called for in the plans. I just couldn’t get it to bend, but I think the oak will work fine. And I broke a piece of plywood when laying the foreward hull. The secret is patience! you had to bend at little at a time (volumes have been written by others about this). Also, you have to position the grain of wood along the maximum axis of curvature. I worked almost entirely alone, with my father, brother, and friends helping a little. This project was probably the single most rewarding thing I have ever done, and I encourage anyone considering beginning a boat to go for it. It was so amazing and rewarding and powerful to see a pile of wood become something beautiful and functional. I learned a lot about carpentry, but more importantly, it was so introspective. Boatbuilding honestly changed my life, it was exactly what I needed. Glen-L plans were excellent and everyone at Glen-L was extremely helpful. Any questions or problems I’d be happy to help out. Good luck! TUFFY / Dan Belyea / Mt. Jackson, VA / daniel.m.belyea@accenture.com / 2-20-02: Have completed all parts and the building form. Have bought majority of wood including 1/4″ Marine Grade AB plywood and oak keel and battens. 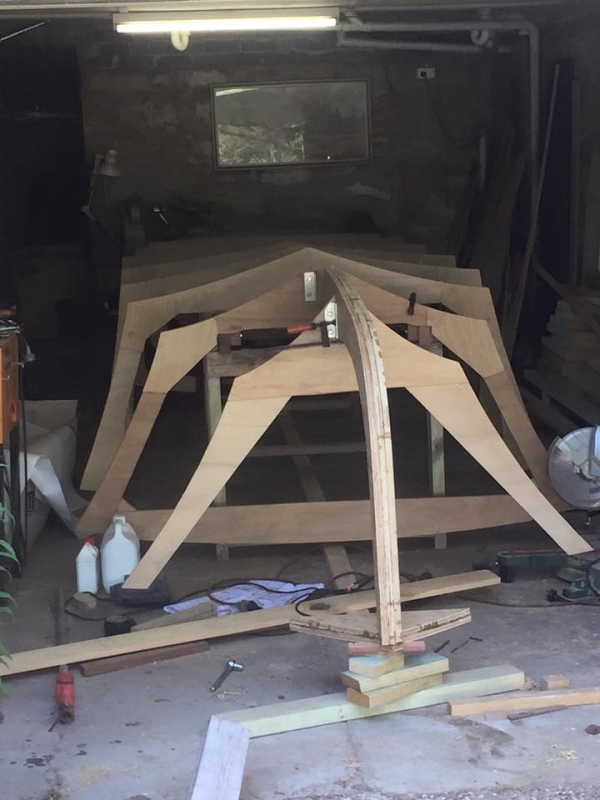 I am preparing to glue frame pieces and stem parts together to complete the three frames and stem and be ready to add Keel and Battens. TUFFY / Scott D / Narraganset Bay, MA / sndspike@aol.com / 1-22-03: Ready to apply bottom and side panels. 5-12-03: Progressing slowle, but I try to do a little every day. TUFFY / David McAdam / Ireland / mcadamd@eircom.net / 8-17-03: Finished the building form, still putting mahogany frames together. TUFFY / Allan Gillis / m_bollinger@shaw.ca / 8-17-06: I previously built your TNT and I have now built the Tuffy model (white with blue stipes). A little about the boat: I built it spacifically to use in rivers as a jet boat and modified the original design. The transom motor mounting hight was raised 7 inches. The transom angle was changed to 18 degrees. The boat bottom now has a tunnel extending 2 feet forward, 2 inches tapered from transom, 16 inches in wide. These changes were made to accommodate a jet 40 Merc outboard, the tunnel allows the jet intake to not be below the bottom of the boat. The boat is epoxy encapsulated on the inside and fiberglassed on the outside. TUFFY / Scott and Cameron MacPherson / Ontario, Canada/ravenautical@hotmail.com / 10-2-07: Started 11/12/05: Got basically everything cut out and measured, products collected, and hardware bought, ready to start. Took a break for the summer of ’06. Started up again in the fall of ’06. Finished 12/08/07. We full out fiberglassed and painted. Great little boat. Put a 40hp 4 stroke EFI Mercury on the back. Fast, quiet, and fun. Does 39mph with aluminum prop. See what happens with the SS prop. Handles great with one person, better with two. $10,500 project. Very worth it though. Cost breakdown: New motor $7500; Controls, RPM cable, Steering, Seats, Battery, Trim Tabs: $1000; Paint and fiberglass: $900; Hardware: $100; Wood: $1000. 3-12-08: When my dad and I completed the Tuffy we did not do any modifications at all besides raise the transom height to 20″ using stainless steel. What sits on the back is a brand new Mercury 40hp 4 Stroke EFI 2007 that I bought at the Toronto International Boat Show earlier that year. It turns a 10.25′ x 14’P aluminum propeller that sets us close to 40mph with the trim all the way down. It has power trim so we will see more speed in the future… We installed the works into her; gauges, no feedback steering, up front 11.5 Gallon gasoline tank, nice throttle and shifter and Nauticus smart tabs. We are adding more and more to it each day. It has been one of the most interesting projects I have ever done. I will soon be buying either plans for the Zip and/or the Squirt. I am buying two used outboards which are the Mercury Mark25H 1958 and 1961 Mercury 650 65hp outboards for under $1000 in total. TUG ALONG 16′ / Jeremy Hawn / Plattsburg, Missouri / jeremy073@centurytel.net / 6-24-2010: Started building 21 June 2010; now in the process of stitching the hull together. TUG ALONG 16′ / Richard MacRae / Toronto, Canada /richard.macrae@rogers.com / 1-13-2011: I’ve been building the Tug Along 16′ with my son, since the end of September, 2010. I’ve completed the hull, deck and installed the bulwark, motor well sides and transom. I’ve also painted the bottom interior of the hull below the water line. TUG ALONG 18′ / Wayne Conklin / Spring Hill, Florida /wconklin7864@bellsouth.net / 10-30-2010: I actually started the Tug Along 18 today…starting by cutting out the hull sides/then the hull bottom/battons/keel etc…. 11-15-2010: I recieved the plans in early September, secured a workshop, ordered some plywood and started cutting it October 28th. All parts for the hull have been cut, including temporary forms. I have the sides glued together, and will start gluing the hull bottom this week…hope to order the stich & glue kit soon. TUNNEL KING / Daniel Boulet / Montreal, QU, Canada / dboulet1@videotron.ca / 9-28-03: I’m at studying the plans and the instructions. My goal right now is to read over and over the instructions and studying the plans at the same time to get a complete picture of the whole project before I start cutting the first piece of wood. TUNNEL MITE / John C. Smith / Edmonds, WA / jjcsmith026@aol.com / 4-2-00: Completed 5-7-03: Barry, the tunnel-mite was completed about 30 days after I got the plans. Photo’s of it are on the archived photo board. TUNNEL MITE / Jim Guarino / jguarino@artguildinc.com / 10-19-01: I started my boat in July 2001. I am, at this point, completely epoxied. I have made a few modifications along the way. 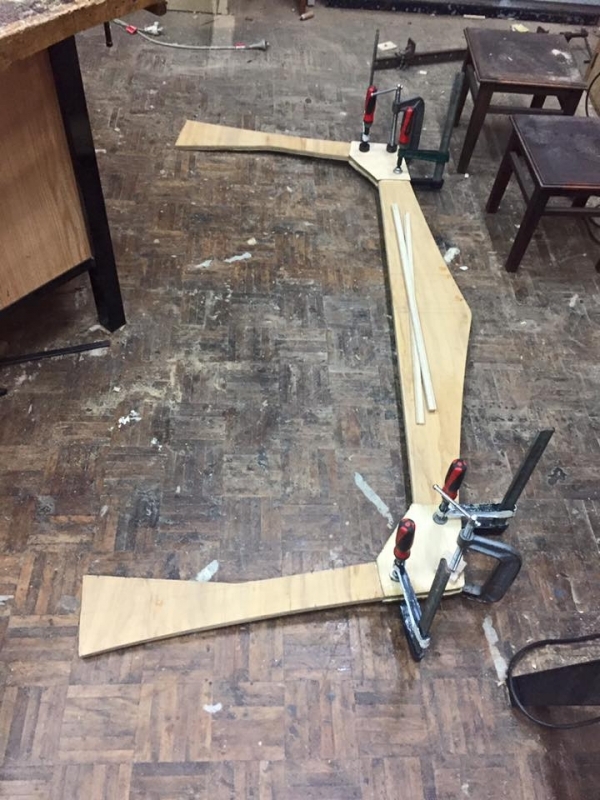 I’ll explain… #1-I used 3/4″ thick plywood for the hull frames, it worked very well, it saved weight, and I was able to route them from a template. I glassed them in prior to closing the hulls. #2 I had stainless steel fuel tanks made to go in the hulls. One on each side, 3 gallons each, tight to the front of frame 2. This cleaned up the cockpit, no need for the red fuel tank bouncing around and it brings the weight of the fuel forward. #3 I increased the height of the dashboard, which gave me room on the dash for gages and gave the cowl a real nice aerodynamic shape. Now I am filling and sanding in preparation for primer. 5-6-03: I’m still alive and ready to run my boat for the first time this spring. It turned out great and I want to scan some photos and I will e-mail them to you and update my registry so others can contact me. TUNNEL MITE / Steve Abplanalp / steve66614@yahoo.com / 12-10-01: Approximately 2/3 complete on the wood construction. 5-6-03: Project “stalled-out”, but, still planning to complete. All woodwork is done. Glass and all mechanicals remain to be completed. TUNNEL MITE / Donnie Gilliland / drgilli@charter.net / 11-6-04: I am constructing the Tunnel Mite for my nephews and granddaughter. I just finished the tunnel sides and planking and anticipate turning it over to start on the top side in the next few days. I’d really like to get it finished for summer. 3-14-06: Well as everyone knows, time flies. Here it is March of ’06 and I am just now applying the side decking and cowl. It went on very quickly but now I’m starting the fairing and filling of the top side. I’m struggling with the fairing of the scarf joint on the forward section of the side decking; it’s just so flat! I suspect by next week, I’ll be applying the seal coat and ‘glass to the top. Then the 3rd and 4th coats of Poxy Shield will go on. I’ve begun to research paint and finishing choices; it’s even more confusing than I anticipated. I have a lot of help with paint schemes to choose from thanks to my nephews and granddaughter. I look forward to the launching sometime this summer, I need to get it completed and out of my woodshop so I can start on the Tiny Might. TWO PLUS / Jeff / madeira@gte.net / 2-10-00: Finished frame #2. 5-4-00: Finished final frame. Starting work on breasthook and stem. TWO PLUS / Kjetil Petersen / Norway / lillmgp@online.no / 6-29-02: Started project mid april 2002. Have completed frames and set up everything on buidling form. Frames made of Norwegian spruce (heartwood). Keel and bottom battens + chine log finished. Can only work a few hours every week. But I hope to be able to turn the hull over sometime in august 02. 9-2-02: The hull is completed. I used 10mm Okoume marine plywood for the sides and the forward section of the bottom. This plywood is very lightweight and easy to bend, a little soft though. The bottom is covered with meranti plywood. To further increase the bottom strength I used 400 gr. Biaxial glass. The sides are covered with 200 gr. ordinary glass cloth. Basically I could now sand and paint. But the hull is looking so incredibly good that I really want to go all the way and cover the sides with mahogany strips. I am currently trying to find a local supplier for this. I won’t be able to keep my schedule of turning the hull his month. But still I hope to get the boat completed for next summer. 5-29-03: My Two Plus project is going quite good. After putting the plywood on the frames I thought the hull looked so nice that I really wanted to create a mahogany cruiser of this boat. I found a local supplier of Khaya mahogany. I ordered 6mm thick and 45 mm wide strips that had bed and cove as in strips used for strip planking. This in some ways made it easier to glue the strips to my hull. But I found that in the areas near to the bow these strips where a little too wide to be used with bed and cove. Very difficult to get a tight fit. TWO PLUS / Ahmed Ahmed / Dubai/U.A.E. / ahmed.ahmed@zu.ac.ae / 10-8-05: Purchasing framing materials.